My daughter has a sense of humor and one thing that gets her going are funny faces. She might notice a funny face on a sticker, halloween decorations, etc. and will just laugh and talk about the funny face. She was in need of some eggs for her kitchen, so I decided to give them funny faces. They were just too plain without them! For the eggs, I just cut two oval shaped pieces from fleece, sewed them together leaving an opening for turning, turned them right side out, stuffed them, and then stitched the opening shut. For the faces, I crocheted the circle then embroidered or used felt for the facial features. Then I just glued them on. I’m also using these eggs to teach her about feelings. As you can tell, some are happy, sad, surprised, etc. I really love this–I am working on a post about books that help children understand emotions and would love to share this craft idea (with credit and a link to you, of course) if that is okay with you! Such a great idea! that’s so cute! 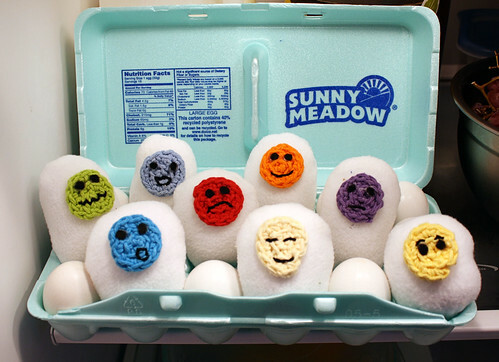 love the idea and the eggs! Cute! What a lucky little girl to have such a creative Mom like you!